McNary senior Caleb Kiefiuk Yates’ college choice checked off every box. 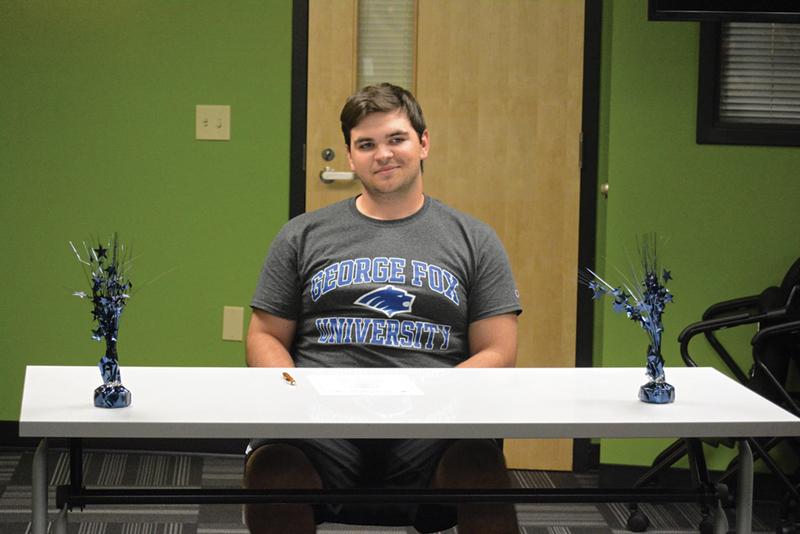 Along with the opportunity to play football and a strong mechanical engineering program, George Fox University will also help Yates practice his faith. Yates, who will graduate with a 4.0 GPA, also wanted to stay close to home. “I like going off to new places and exploring but the valley is just where I enjoy being.” he said. Yates got into contact with George Fox early in his senior football season. One of his old teammates, Hayden Sader, is on the roster. After a couple of visits to the campus in Newberg, Yates knew that’s where he wanted to go, too. “After I had seen whaat all they had to offer, they were my No. 1 and I knew that’s where I was going,” said Yates. McNary head varsity coach Jeff Auvinen first got to know Yates as the coach of the freshmen team. He was on the field for every play at defensive end and tight end. Yates was primarily on the offensive line as a junior and then moved to defensive end, where he’ll play in college, this past season. McNary offensive coordinator Brad Emmert also highlighted Yates’ leadership.